Assuming that ISIS was behind the Tehran attack, as it has claimed, I have a few observations. 1) Attacking Iran differentiates ISIS from al-Qaeda. AQ has probably wouldn’t attack Iran due to the contours of the AQ/Iran relationship. Similarly, ISIS propagandized against the Taliban by arguing that they wouldn’t fight Pakistan, while ISIS was killing Pakistani soldiers. So there’s an obvious propaganda play ISIS can make here for a Sunni audience, parallel to its earlier Pakistan propaganda. 2) Iran is at the forefront of pushing ISIS’s caliphate back. So this is similar to other ISIS attacks against coalition countries. Nor is it clear that ISIS is concerned about provoking Iran: They already have provoked Iran. It’s fighting them on the ground now. 3) Wild card possibility: Unlikely, but could ISIS be making a play for Sunni state support, similar to what al-Qaeda gets? There are various reasons that I would bet against this, but I would put it on the table as a possibility, however remote. Although little-noticed at the time, Ahwaa’s seemingly innocuous project was in fact revolutionary. Homosexuality in the MENA region is not only stigmatized but generally criminalized and banished from the public sphere. The creation of an online platform where LGBT people could candidly discuss the issues affecting their lives, such as romantic relationships or the tensions between Islam and gay rights, was thus a direct challenge to deeply inscribed cultural and religious norms. Indeed, Ahwaa heralds a wave of challenging ideas that, fueled by rapidly rising Internet penetration, will soon inundate Muslim-majority countries. Online communications, by their nature, give marginalized social and political groups a space to organize, mobilize, and ultimately challenge the status quo. In the MENA region, online spaces like Awhaa will give sexual minorities the ability to assert their identity, rights, and place in society. So too will the Internet amplify discourses critical of the Islamic faith, or of religion in general, and solidify the identities of secularists, atheists, and even apostates. The rise of these religion-critical discourses will in turn trigger a backlash from conservative forces who fear an uprooting of traditional beliefs and identities. The coming social tsunami should be visible to anyone who knows what signs to look for. Shielded by the relative anonymity of online communications, marginalized individuals of all stripes can discuss intimate and controversial issues. The Internet, furthermore, allows like-minded people from disparate corners of the world to find one another and create virtual communities. An atheist living in rural Egypt, for example, may not know anyone else who shares his views. But when he goes online, he will find millions of people who do. — and as it blossoms, the black swirl of repressive backlash again threatens it. The Internet allows anti-Semites to communicate, collaborate and plot in ways simply not possible in the off-line world. New developments and new propaganda items are a constant part of the ISIS landscape, whereas content in white nationalist networks tends to be repetitive, with few meaningful changes to the movement’s message, landscape, or political prospects. A notable exception to this is Donald Trump’s presidential candidacy, which has energized white nationalists and provided new talking points and opportunities for engagement. Trump’s candidacy is likely driving some portion of movement’s recent gains on Twitter. And again likewise, this blossoming begins to be threatened by its own backlash — the blossoming of internet speech within contrary geographical cultural norms cuts both ways. It’s almost apocalyptic — that internet space blossoming can open up cracks in what David Brooks called “the post-World War II international order — the American-led alliances, norms and organizations that bind democracies and preserve global peace” — to which Steve Bannon is vehemently opposed. The coming social tsunami should be visible to anyone who knows what signs to look for. Regardless of their ultimate outcome, however, signs of the coming Islamic culture wars can already be discerned. Western observers have long overlooked or misinterpreted social trends that have swept through Muslim-majority countries. This is one trend that they cannot afford to miss. New at @ForeignAffairs: "The Coming Islamic Culture War." Daveed is worth reading and heeding, especially when he says he’s written something of particular consequence — so read his Foreign Affairs piece. In the overall flow of Daveed’s piece that’s a simple introductory remark, an observation of fact. From my point of view, though, there’s more to it than that — it’s a disjunction & conjunction of the two realms of geography and cognition, matter and mind, or “outer and inner space” if you will. And that’s something always worth noting. Here, the supernatural sits comfortably above (Latin: super) the natural. 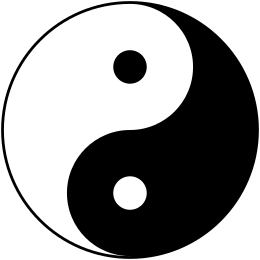 The physical-metaphysical (body-mind; outer-inner; objective-subjective) disjunction & conjunction is recognizable in Descartes, and takes contemporary form as the so-called hard problem in consciousness. 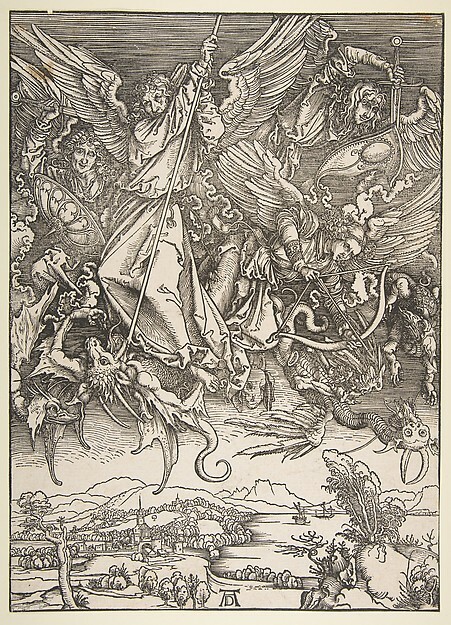 It’s significant that the “war in heaven” of Durer’s vision no longer fills the skies in our contemporary images of war, though heaven and hell are no less with us than before..
And so I note that, en passant, Daveed has alluded to what is perhaps the great schism of our time, that between visionary and factual truths. Fact is not the truth of myth; myth is the truth of fact. John of Patmos, the alchemists, Durer, Blake, Jung, Raine, have the richer vision. The issue is complexity, and how you represent it. The case in point is Syria. 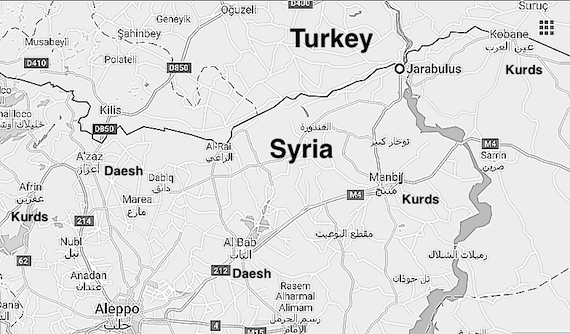 The Turkish incursion into Syria at Jarabulus was advertised as an attack on a Daesh (ISIS, ISIL) stronghold and smuggling station in conjunction with (fundamentalist) remnants of the Free Syrian Army. But the southern outskirts of Jarabulus had already fallen to the Pentagon-backed Syrian Democratic Forces, which are majority Kurdish but have a significant Arab component. The Arab, non-Kurdish SDF brigades such as the Seljuk brigade, the Army of Revolutionaries, and Northern Sun Brigade had fought to liberate the northern Syrian city of Manbij, due south of Jarabulus from Daesh. They have an outpost in the village of Amarna just a few miles south of Jarabulus, where they call themselves the Jarabulus Military Council. The Turkish army, having secured Jarabulus itself with the help of fundamentalist militias, moved down to Amarna, where they met fierce resistance from the Syrian Democratic Forces, who are allied with the Kurds. The Turkish air force bombarded the SDF positions in Amarna and the militias responded by destroying two tanks and killing one Turkish soldier. Fighting continues there. To be honest, I’m not sure which of those means of modeling a complex system leaves us best able to understand the situation on the ground. Sir Mark Allen once told me to fully understand Syrian conflict is like playing 3D chess under water with all pieces moving simultaneously. First, here’s what I call a DoubleTweet, juxtaposing two tweets for the resonance between them — and juxtaposing two thoughts for the resonance between them is about as simple a way of demonstrating the whole being greater than the sum of its parts as I can think of. I don’t actually know if you can outbid and finesse while playing Bridge, but you can in metaphor.
.@POTUS "There's classified and then there's classified." . @billclinton ""It depends upon what the meaning of the word 'is' is." Lawyers — the Clintons & POTUS. Compare philosophers, poets, native speakers, natural language processors. the uproar about the Clinton email server ignores the reality that, for very good reasons, the CIA and the State Department have different approaches to classification and classified information. These different approaches result from the different functions of the agencies. The watchdog [IG] said it found a number of Clinton’s emails that currently contained “classified intelligence community information.” But the State Department has said it did not consider that language classified at the time those emails were sent. Both sides can be correct, said several former officials. And that’s enough hipbonish excitement for one post.